With its red-hot rivers of lava and clouds of ash, Hawaii's Kilauea volcano has captured the world's attention. 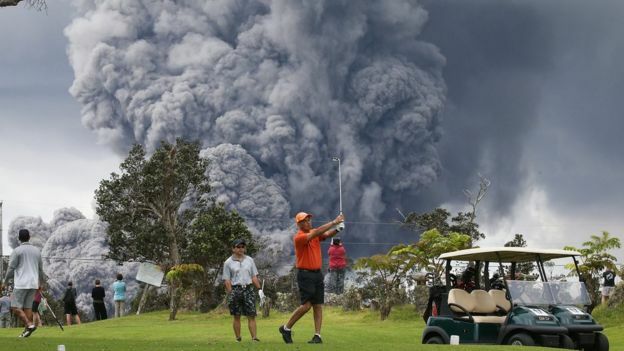 But how dangerous are such eruptions? Every year about 60 volcanoes erupt. Some take us by surprise but others are regular offenders. Kilauea is one of the world's most active - its present eruption began 35 years ago, but there has been an increase in activity in recent weeks. Its lava flows have quite literally been erupting in people's backyards, but thankfully only one serious injury has been reported - a man hit by projectile molten rock as he sat on his balcony. This could appear to suggest that volcanoes aren't all that dangerous, but much of the world's population lives close to an active volcano - and many of these are much deadlier than Kilauea. Since the year 1500, about 280,000 people have been killed by volcanoes - 170,000 of those by just six eruptions. We have compiled these figures using media reports, public records and historical documents. About 2,000 people have been killed since the year 2000. Most of these deaths were caused by volcanic mudflows in the Philippines, pyroclastic flows in Indonesia, lava flows in the Democratic Republic of Congo and volcanic projectiles in Japan. Last year three tourists died in Italy when they fell into a pit in a volcanic crater. At present, about 800 million people live within 100 km of an active volcano - a distance well within reach of potentially lethal volcanic hazards. Of these, about 200 million are in Indonesia. As populations continue to grow, it is likely even more people will set up home close to one of the world's 1,500 active volcanoes, which are spread across 81 countries. "Active" does not mean that all of these volcanoes are erupting, but that we think they have been recently active and are capable of new eruptions. Volcanoes pose many different types of danger to those who live near them. 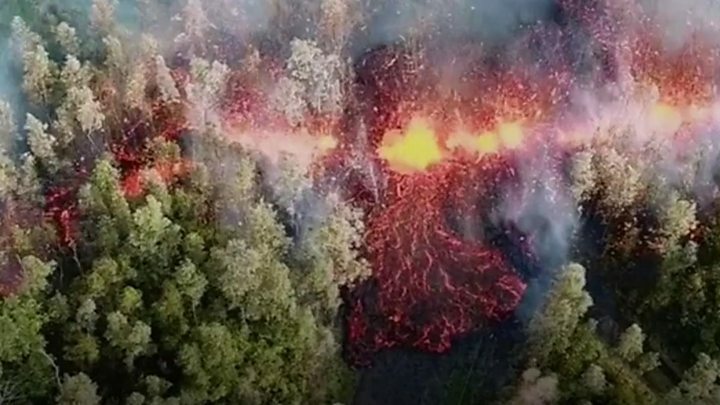 In the case of Kilauea, the United States Geological Survey noticed a marked increase in seismic activity at the end of April, with the first fissures appearing at the start of May. 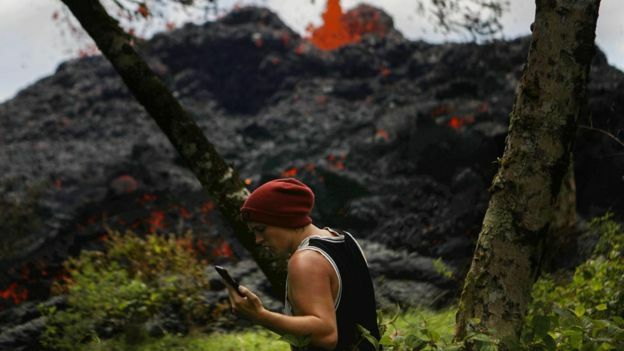 Since then, lava flows have travelled about three miles (5km) to the ocean, destroying homes and leading to the evacuation of thousands of people. Such lava flows don't kill many people. While it burns and buries everything in its path, lava - molten rock that glows red-hot, with temperatures of about 1200C - moves slowly enough that people can normally just walk away. The danger arises when people fail to evacuate quickly. In Hawaii, several people were airlifted to safety after their escape routes were cut off. Lava can cause explosions, including the ignition of pockets of methane gas produced as it buries vegetation. And when it reaches the ocean it forms unstable new land and laze - plumes of steam, hydrochloric acid and glass shards. Another hazard in Hawaii is sulphur dioxide, one of several gases that can be released by volcanoes, even when they're not erupting. However, lava and gas combined account for less than 2% of recorded volcanic fatalities. The largest loss of life to volcanic gas was in Cameroon in 1986, when more than 1,500 people were killed as carbon dioxide from Lake Nyos flowed into surrounding villages. Most people killed by volcanoes are the victims of pyroclastic flows and lahars - volcanic mudflows, packed with debris - which have been responsible for about 120,000 deaths over the last 500 years. These are normally associated with large conical volcanoes found at tectonic boundaries, such as the ring of fire, unlike the gently sloping shield volcanoes, like Kilauea. Pyroclastic flows are very fast avalanches of rock, ash and gas, which can reach temperatures of 700C. They destroy everything in their path, and death is near certain for anyone caught in their way. It was pyroclastic flows that destroyed the Roman city of Pompeii in AD 79. And they claimed nearly 30,000 lives on the Caribbean island of Martinique in 1902. Lahars can contain rocks, trees and even houses. They form as rainfall, snow, or melting ice and wash ash deposits off the slopes of volcanoes and into surrounding valleys at high speeds. In 1985 about 25,000 people were killed by lahars at Nevado del Ruiz, Colombia. In large eruptions volcanic ash can travel hundreds or even thousands of kilometres. It can bury vast areas and disrupt transportation and critical services. Historically, famine and disease have followed such events, with crop failures, or ash and gas leading to temporary changes in the climate. 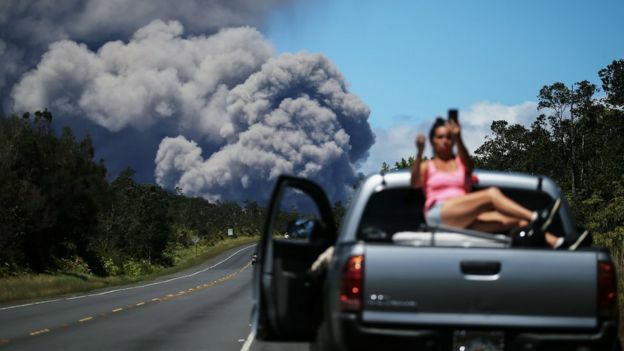 Media captionThe Kilauea volcano erupted after a series of earthquakes on the island. However, while unstoppable, volcanic eruptions do not need to result in death and disaster. That only one serious injury has been reported in Hawaii is testament to the work of observatory scientists and disaster management agencies, as well as excellent monitoring systems. Unfortunately, limited resources mean few volcanoes around the world are as well monitored as Kilauea. Satellite monitoring allows some observation of even the most remote volcanoes, but only about 20% of the world's volcanoes have any ground-based monitoring. And roughly every two years a volcano with no historical record erupts. These can be the most dangerous, as long periods of dormancy can end in more explosive eruptions and the people living near them can be the least prepared. Nevertheless, volcano observatories, researchers and international organisations work tirelessly to respond to emergencies and forecast events, with many tens of thousands of lives saved as a result. Of course, volcanoes don't need to kill people to have a significant impact. Evacuations uproot people from their homes, livelihoods are lost, agriculture devastated and economic loss can run into billions. Even when they appear to be sleeping, we'd be wise to keep watching the world's volcanoes.